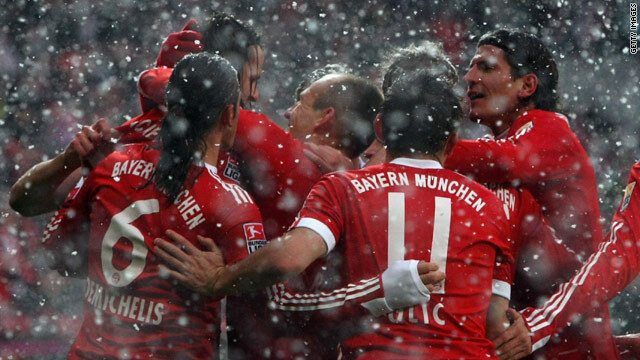 Bayern defied the blizzard conditions to score a 3-0 home win over Mainz. (CNN) -- Bayern Munich went back to the top of the Bundesliga with a 3-0 win over Mainz in the Allianz Arena on Saturday. Bayern were held goalless in the first half but after the break made the breakthrough as defender Daniel van Buyten scored the crucial opener. Mario Gomez and Arjen Robben, with his second goal in two games, completed the scoring to seal the seventh straight win for the Bavarian giants. Previous leaders Bayer Leverkusen face struggling Freiburg on Sunday evening, going into the match with a one-point deficit on Bayern. Van Buyten headed home after a cross from Robben for the first goal before French winger Franck Ribery, who is fighting for fitness after a knee injury, came off the bench on the hour mark. Star duo Ribery and Robben combined to set Germany defender Philipp Lahm down the right flank before he crossed for Gomez to score the second on 75 minutes. Robben struck with four minutes remaining to seal the three points. Elsewhere, Werder Bremen coach Thomas Schaaf is under pressure after they went down to a 4-3 defeat at Borussia Moenchengladbach. In the relegation battle, second bottom Nuremberg picked up only their second win in their last 10 games as they won 3-1 at Hanover to leave basement side Hertha Berlin five points adrift after they drew 0-0 with Bochum at home.